Benefits of ConceptDraw DIAGRAM ersus Omnigraffle and MS Visio. In the process of conducting business, sometimes words alone do not have the ability to describe a situation, state, or process with enough accuracy to guarantee successful communication to stakeholders, team members, and other assorted individuals. To convey a faultless understanding to others it is often necessary to include graphics and diagrams to support the meaning conveyed. The combination of words and graphics associated with the text is a powerful cohesive means of communication that removes participant doubt and improves clarity. The end result is to accelerate business. Business today is conducted at an incredible rate. The speed of business has increased for organizations of every size and for all participants. With Dynamic presentations, you can display your presentation on a secondary monitor or projector, while your main monitor is left open for you to make edits as you move through the presentation. This allows you the unique ability to collaborate with team members in a meeting setting or quickly respond to feedback from your audience. Any diagram or drawing you make in ConceptDraw DIAGRAM can be a dynamic presentation — everything from flowcharts and block diagrams to network diagrams and wiring schematics. All source documents are vector graphic documents. They are available for reviewing, modifying, or converting to a variety of formats (PDF file, MS PowerPoint, MS Visio, and many other graphic formats). Relative value is a value measured in the terms of liquidity, risks, return of one investment or financial instrument relative to another. Relative values are widely used in:business, economics, investment, management, marketing, statistics, etc. ConceptDraw DIAGRAM v12 software is the best for drawing professional looking Relative Value Charts. ConceptDraw DIAGRAM v12 provides Divided Bar Diagrams solution from the Graphs and Charts Area of ConceptDraw Solution Park. If you ever wanted to try any diagramming tools except of Visio, but were afraid to lose existing documents, there’s good news for you. One of the most striking features of ConceptDraw DIAGRAM v12 is it’s perfect compatibility with MS Visio, which guarantees that you won’t depend on operating system anymore, because another ConceptDraw DIAGRAM v12 feature is that it’s cross-platform tool. Don’t waste your time looking for other options, you’ve found the solution already! Business professionals often utilize the MS Visio as a common tool for making various issues on business visualization. MS Visio is a strong software with good capacity to maintain complex business solutions. But there is no MS Visio for Apple OS X . This is a large invocation, and one would be pleased to recognize that ConceptDraw DIAGRAM v12 is the ideal alternative to MS Visio. Primarily, because this software works natively on both Windows and Apple OS X platforms. if you have migrated from Windows to Mac, or need to communicate in a cross-platform conditions, you’ll search for MS Visio replacer. 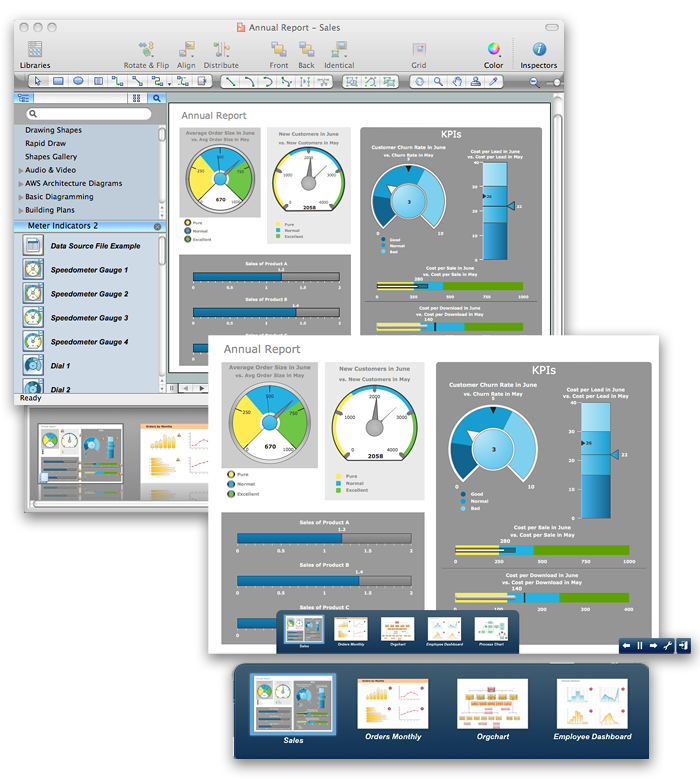 ConceptDraw DIAGRAM v12 is the exclusive professional business diagramming application that runs on both Windows and Apple OS X. The opportunity exchange files between PC and Mac, as well as between ConceptDraw DIAGRAM v12 and Visio is the significant advantage that permits you to display and to collaborate business information in effortless and cost-effective way. Comparing ConceptDraw DIAGRAM v12 to Omnigraffle - Cross platform product. While most drawing tools are designed for use on one operating system, ConceptDraw DIAGRAM v12 is available as two independent and concurrent versions on both Macintosh (OS X) and PC (Windows). License is per named user. That means you can use a single license for Macintosh and PC. Users can install at work and at home with a single license.